So now when its Text property is set, HtmlTextBlock first treats the input as valid XHTML and tries to parse it with XmlReader. This is the most efficient code path and should be successful for any valid XHTML input. The first method works in browsers that return XHTML for an element's innerHTML property even if the contents of the element are not valid XHTML (ex: Firefox) and simply inserts and retrieves XHTML from the innerHTML property. The second method works in browsers that return the contents of an element as-is (ex: Internet Explorer (though it works fine in Firefox, too)) by walking the node's .firstChild/.nextSibling/.nodeName tree and manually building up the corresponding XHTML as the nodes of the tree are visited. The results of this method appear ideal in most scenarios, though it's possible to come up with edge cases where its output is slightly different from that of the browser itself (Internet Explorer): foo<b><i>bar</b>baz. Strangely, BOTH browsers prefer <br> to <br/>, going as far as transforming the latter into the former despite the fact that doing so creates invalid XHTML! If all parsing attempts fail, the supplied text is used as-is with no formatting applied. A kind reader informed me that an HtmlTextBlock created in code (vs. in XAML as my sample demonstrated) did not seem to do text wrapping properly. The problem was caused by the difference in when the Control.Loaded event fires in the two scenarios. The fix is a simple change to HandleLoaded that skips sizing the contained TextBlock if the HtmlTextBlock hasn't been sized itself. Additionally, the sample code now demonstrates how to create a HtmlTextBlock in code - just #define CREATE_IN_CODE to see how. Because HtmlTextBlock used bool variables to track the bold/italic/underline states, nesting a style caused that style to be prematurely removed. Specifically, the following scenario would not display properly: normal <b>bold <b>also bold</b> still bold</b> normal. HtmlTextBlock now handles nesting properly by using int variables. In its introductory post, I said that HtmlTextBlock is obviously nothing like a complete HTML rendering engine - and that statement remains true today. However, by taking advantage of the host browser's DOM to transform invalid XHTML input, HtmlTextBlock is much more flexible than it used to be. That - and a few fixes - makes it an even more compelling option for rich text display in Silverlight! Last night we published the 10920 release of the AJAX Control Toolkit. This release continued our trend of focusing on the most popular bugs and work items identified by the user community in the support forum and online issue tracker. A number of popular issues got fixed in this release, addressing nearly 1000 user votes! Controls with Embedded styles (Calendar, Tabs and Slider): Toolkit controls no longer need explicit style references when loaded asynchronously. For example, if a Calendar control is placed inside an UpdatePanel and made visible on an UpdatePanel postback, the embedded styles are now loaded properly. PopupBehavior positioning (AutoComplete, Calendar, DropDown, HoverMenu, ListSearch, PopupControl and ValidatorCallout): PopupBehavior now respects the position of its parent element even when the browser window is very narrow or the parent element is close the window edge. Focusing extended controls (Accordion, CollapsiblePanel, DropShadow, Tabs): Pages that use Toolkit controls which re-parent DOM elements can use a workaround to focus a specific element on page load. The new method Utility.SetFocusOnLoad ensures that the desired control receives focus. Calendar: Property to specify the position of Calendar, a default date feature that allows the calendar to start out with a selected date, and a consistent show, hide and focus story that makes the Calendar user experience more intuitive. ModalPopup: Ability to disable repositioning of the ModalPopup in response to window resize and scroll. ConfirmButton: ModalPopup functionality now supported in addition to the regular windows alert dialog. MaskedEdit: Extended Textbox no longer uses Invariant culture if no CultureName is specified and falls back to the Page Culture. AutoComplete: Allow users to associate additional data with the AutoComplete suggestions. Slider: Slider can be easily customized using its various CSS properties. Extender designer support: Enhanced designer support for Toolkit controls using the new "Add Extender" user interface. One thing we'd hoped to include with this release didn't quite make it in: our new automated testing framework. This framework is based on a different approach than our current framework - one that makes it easy to add additional test cases and leverage existing ones across new scenarios. The new testing framework has already dramatically improved our test coverage, helped identify new issues, and made fixing existing issues less risky! But we've been iterating on the new framework for the past couple of weeks and faced the usual decision when it came time to finalize this release: slip or ship. We slipped our release date a little in the hopes that we'd be able to include the new framework with this release, but eventually decided not to delay all the great new Toolkit code any longer. We wanted our users to take advantage of the new bits ASAP - so stay tuned for more on the new testing framework in a future release! As always, it's easy to sample any of the controls (no install required). You can also browse the project web site, download the latest Toolkit, and start creating your own controls and/or contributing to the project! 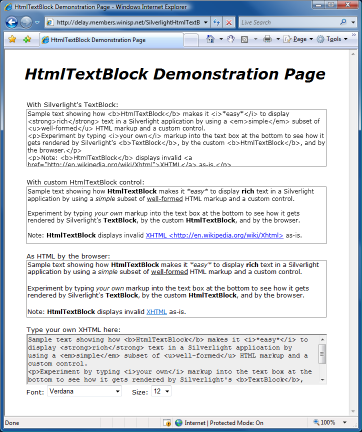 HtmlTextBlock supports the following HTML elements: <A>, <B>, <BR>, <EM>, <I>, <P>, <STRONG>, and <U>. Attributes are not supported with the exception of the <A> element's HREF attribute (see below). I initially planned to have HtmlTextBlock derive from TextBlock and simply override its Text property. However, TextBlock is sealed, so that wasn't going to work. The next obvious approach was to have HtmlTextBlock be a Control with a TextBlock inside it, so that's what I've done here. My goal of "plug-compatibility" (i.e., the ability to easily replace TextBlock with HtmlTextBlock) meant that I needed to manually implement the various TextBlock properties on HtmlTextBlock and pass them through to the underlying TextBlock. So HtmlTextBlock doesn't actually derive from TextBlock, but it behaves as though it did. HtmlTextBlock uses an XmlReader to parse its input when creating the Run and LineBreak elements for display. This makes the parsing implementation simple and robust, but breaks down when the input is not XHTML (such as invalid HTML or valid HTML where empty elements don't have a trailing '/' (ex: "<br>" instead of "<br />")). In the event of a parsing error, HtmlTextBlock's default behavior is to display the input text as-is, just like TextBlock always does. Unfortunately, non-XHTML is pretty common, so certain scenarios may benefit from a custom HTML parser implementation that is more flexible in this regard. HTML rendering is covered by a detailed specification, but some of the rules are not what one might expect. Specifically, the rules for handling spacing and whitespace (' ', '\n', '\t', etc.) can be tricky to get right. I've made some attempt to ensure that HtmlTextBlock follows the rules where possible and convenient, but it was not my goal to achieve 100% compliance in this area. Playing around in the demo application, HtmlTextBlock should pretty closely match the browser's HTML rendering of valid input, but if you know the rules, it's not too difficult to trigger whitespace rendering differences. Silverlight's default font, "Portable User Interface"/"Lucida Sans Unicode"/"Lucida Grande" doesn't seem to render bold or italic text any differently than normal text. This always surprises people the first time they try to figure out why their text isn't bold/italic. I don't know why this is myself, but I'd guess it relates to keeping the download size of Silverlight to a minimum. HtmlTextBlock is obviously nothing like a complete HTML rendering engine [that's what web browsers are for! :) ]. However, if you want to add simple support for rich text to your Silverlight application without a lot of work, HtmlTextBlock may be just the thing for you!